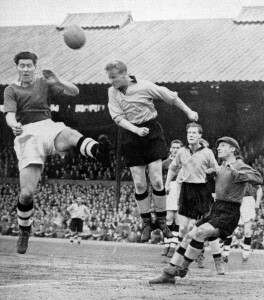 Bert Williams applies the brakes in time and leaves Ron Flowers to head clear in Wolves' big top-of-the-table game at Chelsea in April, 1955. Ron Flowers has expressed his joy at hearing that his former club and country team-mate Bert Williams has been made an MBE. 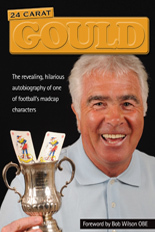 The legendary Molineux keeper was named yesterday as the recipient of the accolade in the Queen’s Birthday Honours List, having narrowly missed out in the New Year’s List last winter. “I was really chuffed to hear the news,” Flowers said. “It’s absolutely great. “The years are going by too quickly for us but we all marvel at how well Bert still looks. “I was fortunate enough to be at his 90th birthday party a few months ago and now he has also got this against his name. “He was in the Wolves side the day I made my debut for the club against Blackpool in 1952 and he was also in goal when I played my first match for England a few years later, so obviously he played a big part in my career. “And he was one of four players from Wolves who were involved when I first represented my country. Flowers shared a room on that trip with Roger Byrne, one of the Manchester United greats who was killed in the Munich Air Crash, and didn’t play another international for three years. 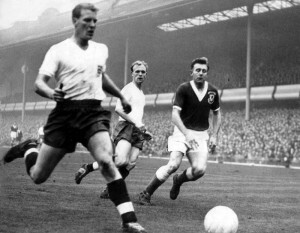 Flowers, with Wolverhampton-born Don Howe in the background, in action for England against Wales at Villa Park in 1958. 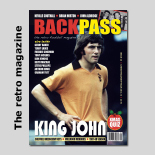 He then made up for lost time, though, by reeling off 40 international matches in a row on his way to becoming Wolves’ second most capped England man of all time with 49 appearances. While Williams found himself a man in demand in the build-up to England’s opening World Cup game in Rustenburg last night, being interviewed on BBC TV as well as Radio 5 Live, Flowers has been left musing over a major coincidence. As an unused member of the victorious 1966 squad, he went close to appearing in the final when Jack Charlton went ill the night before the game against West Germany. But the former wing-half was intrigued to be reminded that England started their campaign as hosts with a draw against Uruguay and then had other group games against Mexico and France. Just like South Africa now. Posted on: Sunday, June 13th, 2010.